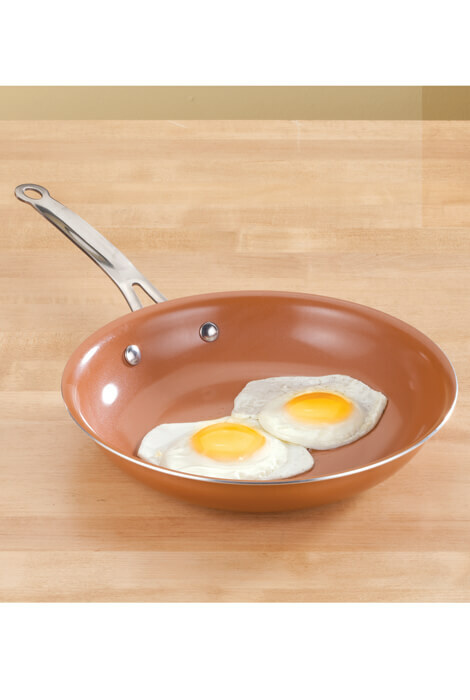 Unique ceramic frying pan offers non-stick ease, allowing eggs, meat and even cheese to slide right off—no oil or butter needed. Versatile 9 1/2" ceramic non-stick pan is oven-safe up to 500°, allowing for quick stovetop-to-oven cooking. Durable, lightweight aluminum construction delivers rapid, even heating. Scratch-resistant surface can be used with metal utensils. Ceramic pan is suitable for all cooktops including induction. 9 1/2" dia. PFOA- and PTFE-free. Dishwasher safe. The 9 1/2" ceramic non-stick pan is awesome!! Nothing sticks & food slides right out. Even fragile fried eggs slip out easily onto the plate. I highly recommend this pan for any cook. Lives up to the hype. Truly non-stick. Chicken breast with no oil or butter, no sticking and perfect browning. I use them for cooking, non-stick and easy to clean. I LOVE THIS PAN! i WILL PURCHASE A LARGER ONE OR MAY THE COMPLETE SET!!!! sO EASY TO USE AND TO CLEAN...HEATS UP WELL OVER MY GAS BURNER!!!! Used this skillet the other day. LOVE it!! It's just the right size that I was needing to put in our camper. Would be nice if it had a lid though. 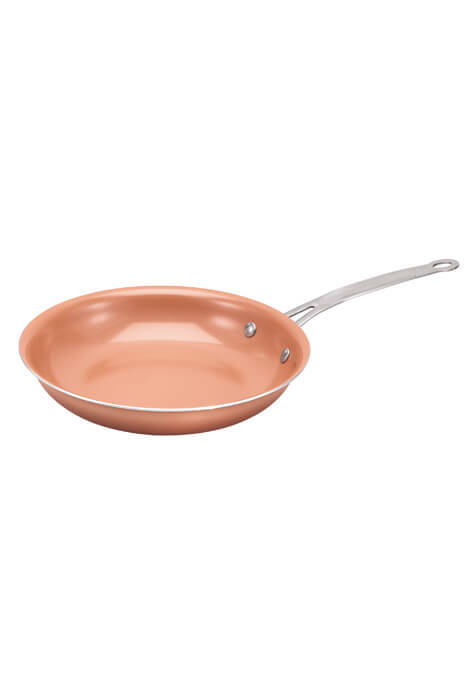 I love this frying pan, cooking in it is so easy and its easy to clean. I wish it came in a larger size. Searched for a non-stick, dishwasher safe 9 to 10 inch pan with a handle that would not jut off at an acute angle at a reasonable price point. I ordered the 10" Ceramic Non-Stick Pan and am thrilled with it. My basted eggs turned out fabulous and slid onto my plate. The pan came out of the dishwasher looking as if it had never been used. I would buy it again. looks cheap! in book. actually impressed it is built well! I would buy another one but larger! Everyone seems to like them. No complaints. This pan is very nice, but I noticed a small chip in pan. I would definitely recommend it to every one! I love this pan! It's the best size for breakfast and nothing sticks. Catalog description says "..can be used with metal utensils." Product paperwork says "Using wooden or plastic utensils with your non-stick fry pan is recommended." I did have a very good experience making omelets with this pan, but bought it because of the catalog description, and am now waiting to see what happens if I forget about the discrepancy. I cooked eggs and turkey bacon and they stick to the pan, but it is easy to clean.